One month tourist visas are now available for Burma (now known as Myanmar). There are five meditation centers in Rangoon (Yangon) that cater very generously for foreign mediators, locally called yogis. They are mostly intensive Insight (Vipassana) Meditation centers in the Mahasi Sayadaw tradition. If you wish to practice for more than a month you will need to arrange a special meditation visa from the meditation centre beforehand. All the centers listed below have an ongoing meditation schedule, so you can go there at any time of the year. If you wish to practice with the main teachers it is best to go there during the 'Rain's Retreat' (Vassa) between July and October. How easy it is today to get self realization! We live in an awesome world full of unpredictable beauties and surprises. The benevolence of the Creator is majestic and spontaneous. Like the movements of our hands when we get in touch with the subtle system. Here is a brief report about the Sahaja Yoga public programs held on 15 and 16 November 2008 in Mandalay, Myanmar. With so many people having received their Self-realizations in what is probably the geographical centre of Myanmar, these divine vibrations will now certainly flow to the four corners of this beautiful land and change the destiny of all its people. Yoga system practiced by ancient warriors of northern Myanmar was to maintain health and protect from illness and disease. It is an ancient physical and mental exercise practiced mostly by ethnic groups living in Southeast Asia and India. Intensive Satipatthana Vipassana, as taught by the late Mahasi Sayadaw, emphasizes the continuity of moment to moment awareness of all physical and mental phenomena. The primary objects of mindfulness are the physical elements (rising and falling of the abdomen during sitting, or lifting, and placing of the feet during walking); mindfulness of non physical elements (mental states, thoughts, perceptions, etc.) is also cultivated. The sequence of meditative experience involves (1) recognition of the object in the field of awareness (2) the deliberate mental noting of the object; and (3) the observation or experience of the object through its duration. (This too, is the format for reporting during the every-other-day interview with the meditation teacher). 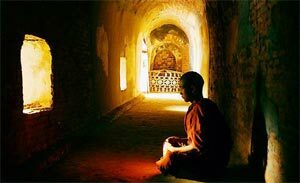 With diligent and continuous practice, this formal processing of all our mental and physical experiences leads to progressively deeper insights into the essential characteristics of all things: impermanence, infelicity and insubstantiality. An alternative schedule of sitting and walking sessions (forty -five minutes to an hour) is scheduled some 13 to 14 hours a day, with two meals before noon. Activities such as speaking, reading, writing and listening to tapes, etc. are squarely discouraged. As impediments in the cultivation of continuous awareness. Usually there is a daily, or occasional, Dhamma Talk by the Abbot known as the Sayadaw. The day starts at 3 am and continues until 11pm with breaks for meals, bath, etc. Almost the entire day is spent in silent individual meditative practice alternating with group sittings in a meditation hall. Individual interviews with the meditation teacher are scheduled at regular intervals to enable the mediators to report their dedicational experiences and to receive necessary guidance by their teacher for further progress. In addition, Dhamma talks will be given from time to time to the practicing mediators by the senior meditation Teachers. Bando yoga focuses on three major areas.